The search continues for a U.S. Marine who was reported missing from a Navy ship as it crossed the Sulu Sea west of the Philippines. 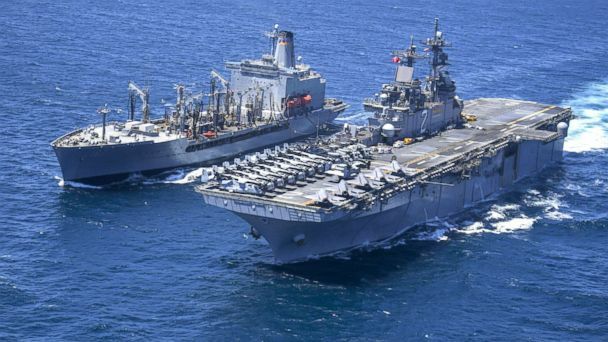 The Marine was reported overboard at 9:40 a.m. local time Thursday by the USS Essex, an amphibious assault ship, according to a press release from the 13th Marine Expeditionary Unit to which the missing soldier was assigned. The Marine's family has been notified, but officials said the identity of the missing individual will not be released while the search is ongoing. "As we continue our search operation, we ask that you keep our Marine and the Marine's family in your thoughts and prayers," said Col. Chandler Nelms, commanding officer of the 13th Marine Expeditionary Unit. "We remain committed to searching for and finding our Marine." Philippine coast guard vessels and a U.S. Navy P-8 aircraft are assisting in the search, which has already covered 3,000 square nautical miles, officials said. "To date, multiple searches have been conducted inside the ship while embarked aircraft aboard the USS Essex conduct round-the-clock search and rescue operations within the Sulu Sea and Surigao Strait," the unit said in its press release. "It is an all-hands effort to find our missing Marine," added U.S. Navy Capt. Gerald Olin, the on-scene commander of the search and rescue operation. "All of our sailors, Marines, and available assets aboard the USS Essex have been and will continue to be involved in this incredibly important search and rescue operation." The 844-foot long USS Essex can transport and support a team of more than 2,000 Marines during an assault by air or land. The ship is based out of San Diego, California.